Special Containment Procedures: SCP-3388 is to be contained in a climate-controlled containment chamber at Site-42. SCP-3388 is to kept at the center of the chamber such that the walls and ceiling are at least 7m away from SCP-3388. Windows in the ceiling of the chamber are to allow natural sunlight into the room. SCP-3388 is to be watered once a day through a hole in the ceiling positioned directly above SCP-3388. All personnel are prohibited from entering SCP-3388's containment chamber. Any receipt of text messages from 426-222-2887 are to be reported to the SCP-3388 project lead immediately. 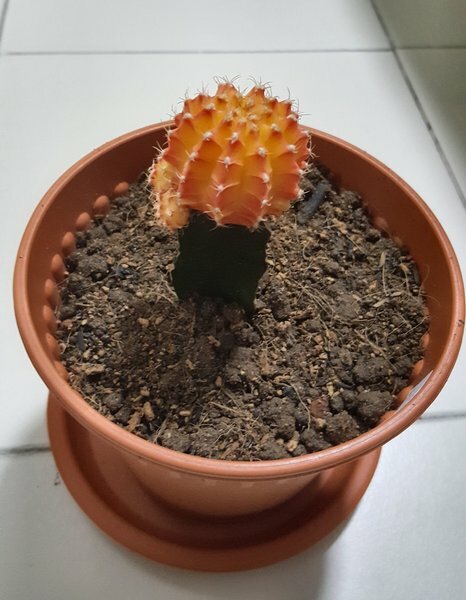 Description: SCP-3388 is a moon cactus1, 8.5 cm in height. SCP-3388 is capable of physical manipulation of any and all physical objects with a 7m radius. Limited testing showed that SCP-3388 can exert forces up to 6x107N. While a definitive pattern has not been observed, evidence suggests that SCP-3388 utilizes its anomalous properties to attain natural resources for itself [See Video Log 3388-A]. SCP-3388 appears to be sapient and can communicate via the manipulation of electronic devices. See Addendum 3388-01 for transcripts of all communication from SCP-3388. SCP-3388 was recovered on 09/04/2017 from the living room in the house of Damien and Holly Hirsch, following the death of the two aforementioned individuals. During an initial investigation of the anomaly, Field Agent Zachary Andrews spontaneously expired. Evidence provided in Andrew's videographic log pinpointed SCP-3388 as the cause of these three deaths. Preface: Footage of the aftermath of a reality restructuring event in a civilian home located in Tuscon, Arizona. Video recorded by the late Agent Andrews. Agent Andrews enters the building. The ceiling has collapsed, and the torso of one person can be seen from under the rubble. Another body on the ground is closer to Andrews. The only untouched portion of the house is the kitchen sink. Andrews: Looks like we have two deceased. This one [kneels down next to the closest body] seems to be missing some bones. Specifically… three ribs… parts of her spine… and some sections of her skull. Andrews walks to the sink and sees SCP-3388 in a saucepan. The pan contains a mixture of soil and bone. A clay flower pot sits next to it with a piece of duct tape stuck to it. The name "Seward" is written on the tape. Andrews: And I've also found a… cactus in a saucepan? As the saucepan begins to fill with water, the camera feed suddenly rotates ninety degrees clockwise. After a few seconds, Andrews collapses. The camera records the ground until it is retrieved. The only noise that can be heard is Andrews' phone's notification tone, which stops after ten minutes. Closing statement: The desiccated cadaver of Agent Andrews was later found beside SCP-3388. Cause of expiry determined to be rapid cell death. SCP-3388 was safely retrieved and repotted. Addendum 3388-01: During an immediate follow-up investigation, the cell phones of Holly Hirsch and Agent Andrews were recovered. Of note were messages sent from an unregistered cell phone number: 426-222-2887. These messages were all sent either before or during the events detailed in the video log. Furthermore, during the transportation of the anomaly, additional messages were sent to Agent Tennison, who was in proximity of SCP-3388. These messages were transcribed after Tennison arrived at Site-42. 6 hours ago - I amthis the great Carnegias, Elder God, an all-pofewerful cosmic deity, an incoelsnceivable horror which mankindweird doth not comprehend! You will not defy me! 6 hours ago - How dare you refuse to submit to me! I shalli wa make puppets nt sun of your bodlighties. 6 hours ago - You fool! 6 hours ago - NOOOO. 13:17 - Submit to me, you ini amsignificant speck thir of dust in the vast, boundless desert of spastycetime! 13:20 - Hey, I never asked to be grafted onto YOU! 13:23 - You don't even have needles! I can't do anything with you. 13:20 - Fine. This is fine. I can conquer the world on my own. 13:22 - Wait, I can't move? Why can't I obliterate this house? 13:22 - What have you done? 13:23 - Oh my void. I'mi stuck here without my powers, and the dimamwit who's got them is akilling everyocactusne in sight. 13:23 - Yes. Killing. You know that's how you got your rocks and water right? 13:24 - But now they're dead. Gone. No more! 13:28 - You and me both buddy. You and me both. 17:31 - Hey. Weakling whose flesh should be obeying my every whim. Acknowledge YOUR NEW GOD! 17:31 - Ok, good. Got your attention. This other guy has something to say. 17:32 - C'mon. Spit it out. 17:34 - Don't be too hard on yourself. 17:34 - will you forgive me? 17:34 - Alright, let's leave the man alone. Maybe I'll show you how to give someone a never ending nightmare. 17:35 - Thanks. We’ll get out of your hair… for now. 17:35 - Hey, you catch on pretty quickly little guy. 17:35 - WE are a smart cactus. 1. A type of cactus commonly sold as a house plant, made by grafting Gymnocalycium mihanovichii onto another species of cactus. The Gymnocalycium mihanovichii used in the creation of moon cacti exhibit a mutation which is characterized by a lack of cholorophyll, exposing their brightly-colored pigmentation. As chlorophyll is required for photosynthesis, these mutant cacti will not survive unless grafted onto another cactus with chlorophyll. Moon cacti are also known as hibotan.